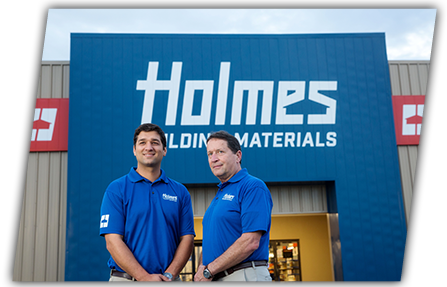 Holmes Building Materials has an exceptional team of people with the largest fleet of delivery trucks in our area. Numbering over 100 strong, our inside and outside sales team, support staff, operators, drivers and managers have a commitment to assist each customer with extraordinary service! We are delighted to help with any project and our trucks are always running! Born and raised in Baton Rouge, Ben enjoys interacting and problem-solving with customers and team members. Michael is a native of Baton Rouge and attended LSU. He enjoys serving customers and working with his team members to provide the highest level of customer service. Born and raised in Baton Rouge, Todd enjoys how our employees function as a team and family to better serve our customers. A native of Centreville, Alabama, Red enjoys the hands-on involvement and interaction of the day-to-day operation of the business. Veteran of US Air Force & Youth Pastor. Jimmy is a native of Baker, LA. Jimmy enjoys helping customers. Bryant studied at LSU and is a native of Baton Rouge. Bryant likes customer interaction and meeting the everyday challenges of the millwork department. Elton is a native of Baton Rouge and holds a degree in Sports Management from Tulane University. He enjoys working with customers and his team. A native of Erath, Louisiana, Robert enjoys meeting and working with his customers to solve problems. A native of Denham Springs, Rhonda enjoys working, laughing and problem-solving with her Holmes family of employees. Baton Rouge native Chris enjoys helping people build their dream homes. A native of New Roads, Kerry enjoys when construction customers come to him for solutions. Jake holds a BS-General Studies from LSU 2010. A Baton Rouge native, Jake enjoys the opportunity to work with residential, commercial and individual builders to achieve their goals of completing their projects to the best of their ability. He also enjoys working side-by-side with experienced staff who can help him find the answers to best serve customers and our community. 26 years in the business, at Holmes since 2007. A native of Baton Rouge and a longtime resident of Livingston Parish, Wade enjoys the daily opportunity to meet new people and be a part of their projects, whether large or small. He loves seeing their projects become a reality. Joel grew up in Denham Springs and graduated LSU in 2000. He enjoys interacting with customers. 20 years in the business, at Holmes since 2009. A native of Livingston Parish, David enjoys working with his customers, both individuals and builders. Born and raised in the Baton Rouge and Zachary area, Jeff studied at both the University of Arkansas and LSU. He enjoys working with a great team that puts the customer first. Chelsie is a native of Denham Springs and has an Associate's Degree in Business from BRCC. Baton Rouge native Chuck likes interacting with customers, especially when he can help them make informed decisions on purchasing products for their projects. 47 years in the business (42 of those at the distributor level), at Holmes since 2017. Mike is a native of Plaquemine/Baton Rouge and graduated from Nicholls State University. He likes estimating specialty products that customers are having a hard time finding elsewhere. 10 years in the business, at Holmes since 2007. Kirk is from Central, Louisiana, and graduated from Southeastern Louisiana University. He enjoys meeting people and helping them with their projects. 19 years in floor covering, at Holmes 2012. Sherri is a native of Denham Springs and graduated with a degree in Industrial Instrumentation from ITI Technical College. She enjoys helping people make their house a home by finding flooring products that help turn customers’ visions into reality. 11 years in the business, at Holmes since 2016. Pennie is a native of Walker, Louisiana, and attended Baton Rouge School of Computers. She enjoys meeting new customers and serving existing customers. A graduate of Bellevue University and native of Baton Rouge, Michael enjoys working with customers. Baton Rouge native Angie enjoys working with the public. DJ Smith 25 years in this business, at Holmes for 1 year. Has lived in Baton Rouge since the 80's. DJ enjoys handling unusual customer requests and tackling the challenges that come with those type requests. 22 years in the business, at Holmes since 2015. Cory is a native of Walker, Louisiana. The best part of his job is seeing people's dreams and hopes become a reality! Whether a new shed, gazebo, outdoor kitchen or even a new house, anything is possible! 31 years in the business, at Holmes since 2002. Madeline is a native of Port Allen and enjoys serving customers. 33 years in the business, at Holmes since 2016. Joe is a native of Memphis, Tennessee, and enjoys helping customers find exactly what they need. 10 years in the business, at Holmes since 2007. A Zachary native, Brigitte enjoys serving her customers all day, every day. 47 years in the business-at Holmes since 2015. Bruce is a native of Arkansas and attended West Arkansas State. Bruce enjoys helping customers and solving problems. 40 years in the business-at Holmes since 2008. David is a native of Denham Springs and studied business. David enjoys helping customers and working with his co-workers. Aubrey attended Southeastern Louisiana University, is a native of Livingston Parish and enjoys satisfying customers’ needs. 30 years in the business, at Holmes since 2010. A native of Zachary, Louisiana, Juanita enjoys helping people get what they need to finish projects and learning something new every day. A native of Baton Rouge, Mason enjoys meeting with customers to help them with their new construction/remodeling projects.